C. S. Co., Ltd (Publisher) ; Wilkie (Publisher) . 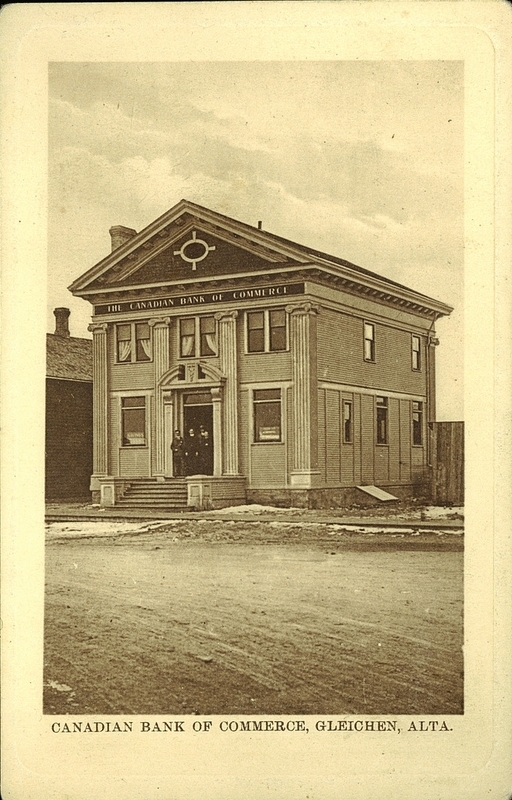 Canadian Bank of Commerce, Gleichen, Alta.. Winnipeg : Gleichen : C. S. Co., Ltd., Winnipeg; Published by Wilkie, Gleichen, Alta, . Description : Front and right side view of The Canadian Bank of Commerce, Gleichen, Alberta. Description matérielle : 1 postcard : sepia ; 14 x 9 cm. PC003705: "Canadian Bank of Commerce, Gleichen, Alta." is licensed by University of Alberta Libraries under the Attribution - Non-Commercial - Creative Commons license. Permissions beyond the scope of this license may be available at http://peel.library.ualberta.ca/permissions/postcards.html.